Off Season. What Off Season? The New Palestine Marching Dragons may have wrapped up another successful season, but it’s full-steam ahead for the Band Program! Students have been participating in Honor Band, working on the Holiday Concert, practicing for upcoming ISSMA Solos and Ensembles and work is already well underway for the 2019 Winter Percussion and Winter Guard season! We are in the middle of a fundraising push for new percussion equipment and there are several listed below. We are off to a great start thanks to Facebook Giving Tuesday and our very own Amanda Aldridge winning a grant for the NPBB. If you have a fundraising or sponsorship lead, please contact Meg Cade (Fundraising for Students) or Amanda Aldridge (Sponsorship Lead). 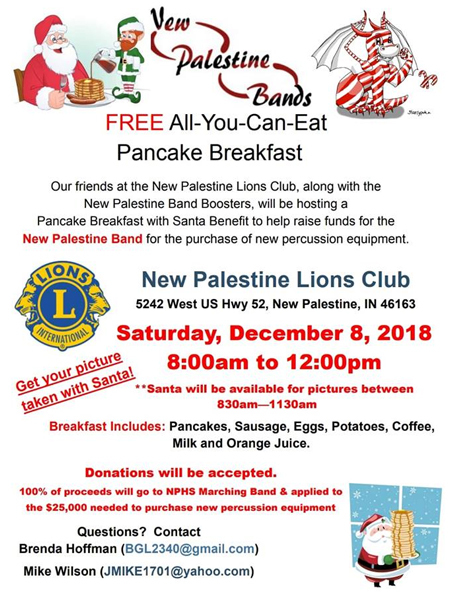 Please join us at the Lions Club in New Palestine on Saturday, December 8th from 8:00-Noon for a fundraising pancake breakfast with Santa. 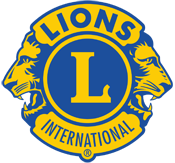 We are raising funds for badly needed new percussion equipment via donations and there will also be the annual Basket Auction during breakfast and concluding Tuesday, December 11th at the Holiday Concert. Information on the flyer below! 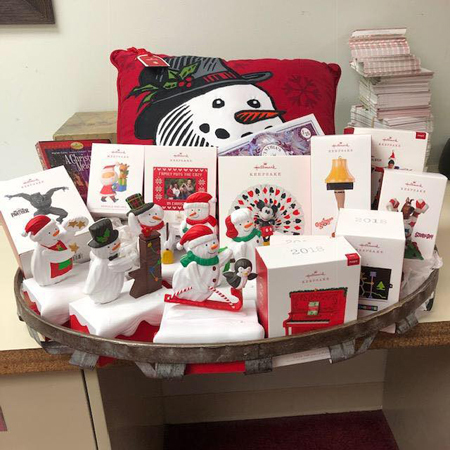 Below from Cynthia’s Hallmark Shop is one of the several baskets up for auction! Thank you to Cynthia’s! 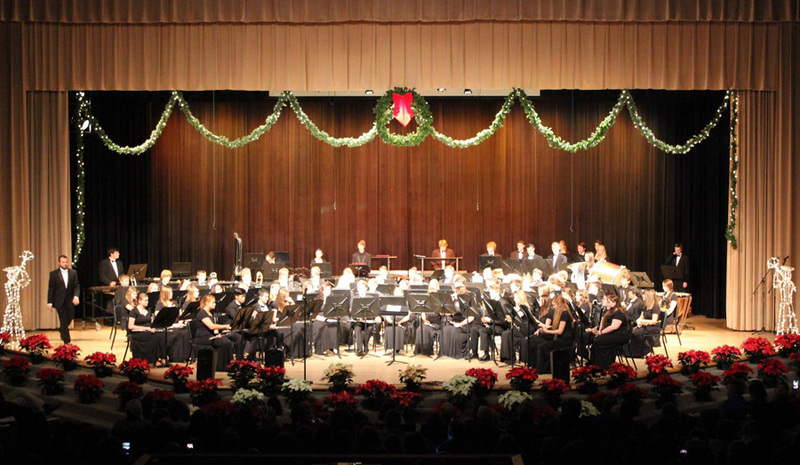 Join us at the New Palestine High School Auditorium on Tuesday, December 11th at 6:30 for our annual Holiday Concert. Fundraising Basket auction will be finalized and juice and cookies will be served! As a reminder, the New Palestine Band Boosters are hosting the next McDonald’s fundraiser on Wednesday, December 12th. Our band program gets a check at the end of the night for 10% of all revenue between 5:00 PM – 8:00 PM. Both Drive-Thru and Dine-In sales. Tell your friends, spread the word, stop in and visit us on New Palestine Band McDonald’s Night! This fundraiser is running for through Friday, December 21st. 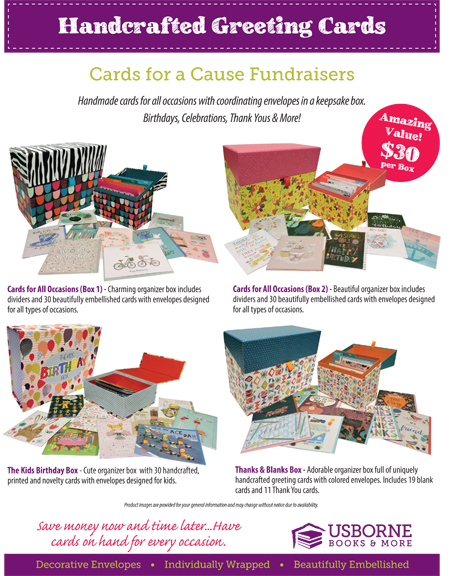 This very well-made and crafty cards are $30 per box and contains 30 cards. There are four styles to choose from. More than $10 per box will go in the student’s band account. (This can be used for fees, uniform costs, NYC trip, etc). The cards will be available for pick up the week we return from Winter Break. Flyers and an order forms available HERE. We will have order forms for pick up in the band room on Friday, December 7th or at Santa Breakfast. Please feel free to contact Dawn Smith with any questions. The NP Bands are raising money for their program through a mattress sale. 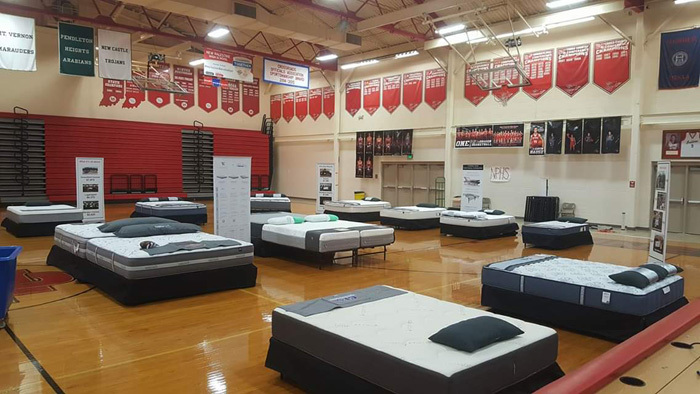 On January 19th, the NP High School will be turned into a name brand mattress showroom where you can try out new beds. You can order your mattress and it will be delivered in about a week. Old mattresses can be removed as well. Major brands are available. Please come and help support our band. Please share this event with your local friends as they could need a mattress. * As reminder, if you are looking for information, have news to share or an idea for content for the website, etc – please email Josh Cade. Thank you!